I can’t believe I'm doing another cupcake post, but I had to share these with you. Once again, it's nothing fancy, just a devil's food cupcake with basic chocolate frosting. Throw in some dirt (crushed chocolate wafers), tombstones (shortbread) and cute little ghosts (marshmallows) and you have a delightful treat not only for the kids but the adults too. I know it's a little kitschy, but that's part of the fun of Halloween. Preheat oven to 350F. Butter 12 wells of a standard muffin pan or line the wells with paper liners. Sift flour, sugar, cocoa, baking soda and salt into a large mixing bowl. In another bowl, mix together the water, oil, vinegar, and vanilla. Add wet to dry ingredients and mix until just combined and batter is smooth. Be careful not to overmix. Divide batter evenly among the wells of your muffin pan. Bake at 350F for about 20 minutes or until the cupcakes feel springy when gently pressed. Cool in pan for 5 minutes then gently remove cupcakes from pan and let cool completely on a wire rack before frosting the cupcakes. Beat butter and cocoa powder until mixture is soft and well combined. Add the confectioners' sugar, 2 tbsp milk and vanilla. Beat until fluffy. Add the last tablespoon of milk if frosting is too stiff. Frost your cooled cupcakes. Place your crushed chocolate wafers in a shallow bowl and dip the cupcake (frosting size down) into the crushed wafers. This is your "dirt". 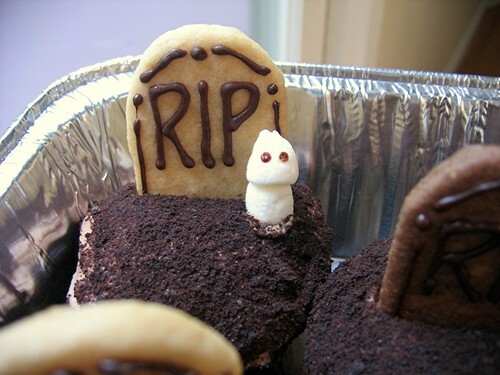 Now insert your tombstone shortbread. To prevent crushing or tearing the cupcake, I usually make a slit in the cupcake using the tip of a paring knife before inserting the shortbread. Add your ghosts. * Use any shortbread or rolled cookie recipe you like. I used a vanilla shortbread cookie recipe and an espresso shortbread recipe. I rolled out the dough and cut out tombstone shapes with a knife. I used melted chocolate chips to write on the tombstones. ** Each ghost requires 2 mini marshmallows. One for the head and one for the body. To make the head, roll the top between your thumb and forefinger to make a slight point. Then slice of a tiny sliver from the bottom to expose the sticky inside and then "glue" the head to the body. To make the eyes, you can use chocolate sprinkles/jimmies or you can using a toothpick dipped in melted chocolate to draw the eyes. 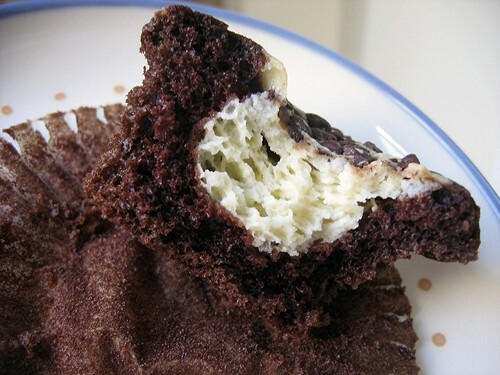 The cupcake batter recipe I used for my tombstone cupcakes is based on this black bottom cupcake recipe. I've make countless batches of these black bottom cupcakes over the last 20 years. They are quick and easy to make and always a big hit. Preheat oven to 350F. Butter 15 wells of a standard muffin pan or line the wells with paper liners. In a bowl, mix together one 8-ounce package cream cheese (softened), 1 egg, 1/3 cup granulated sugar, and 1/8 teaspoon salt. Stir in 1 cup miniature semisweet chocolate chips. Set aside filling while you make your cupcake batter (same recipe as the one used for the tombstone cupcakes above). Make the cupcake batter. Divide cupcake batter evenly among the wells of your muffin pan. (I would suggest that each well be no more than half full with cupcake batter. If you still have some cupcake batter left, then line and fill more wells of your muffin pan.) 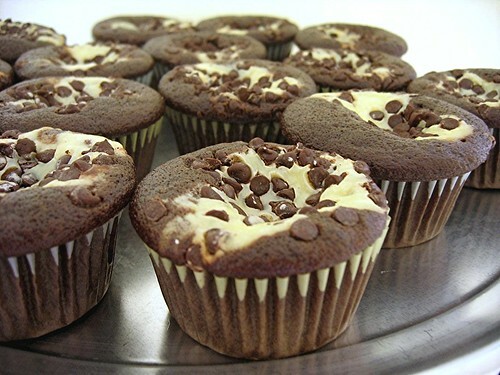 Spoon a few tablespoons of the cream cheese filling into the center of each cupcake, dividing the filling evenly. Your wells might be almost full but that's just fine. 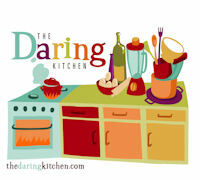 Bake at 350F for about 20-25 minutes or until the cupcakes feel springy when gently pressed. Cool in pan for 5 minutes then gently remove cupcakes from pan and let cool on a wire rack. Sometimes I don’t mix the mini chocolate chips into the cream cheese filling. I just sprinkle the chocolate chips over the filling before baking. They look really great! So pretty! So cute..and I'm sure they taste great, too. Perfect for Halloween. My nieces would love these, Mary! 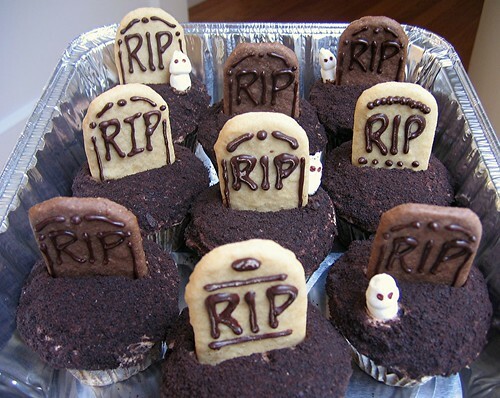 They remind me of the fun I had making a graveyard cake for Halloween last year! I'll try to do here. Cool cupcake recipe to make with the children...great quality time for the family...fantastic pictures.. I am posting this recipe as well but I googled pictures of others who made it and would like to share the different variations I have found. Do you mind if I post your pictures? I will give full credit to you on my blog. Please let me know - you can e-mail me at ezsrecipes at gmail dot com! Thanks!